Whitehead Light Station was commissioned by President Thomas Jefferson in 1803. It was the seventh lighthouse commissioned in the United States and has been in continuous operation ever since. In 1891 the original rubble stone keeper�s dwelling was razed and the current two-family dwelling for the keeper and assistant was built on the old foundation. In 1895 a second assistant keeper was added to the crew. A single-family house for the Head Keeper was built in 1900. The light was automated in 1982 and both keeper�s dwellings were boarded up and abandoned. The lovely Head Keeper's House was torn down in the mid-1980s, and outcry over its demise, along with that of a few other lovely keeper�s houses along the Maine Coast, gave rise to the Maine Lights Program. 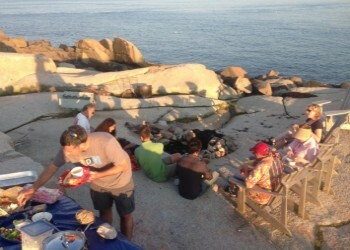 It was through the efforts of the Island Institute that federal legislation was passed that made it possible for responsible owners to be found for nearly all of the 32 lighthouse properties in Maine. 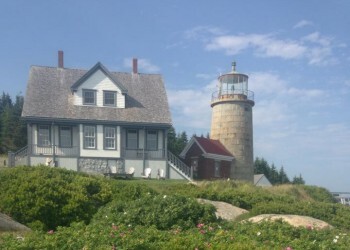 Pine Island Camp, a nonprofit with a 40-year history of responsible stewardship on Whitehead Island, applied for and was granted ownership of the Light Station in 1997. The entire Whitehead Light Station facility is being offered for rent by the week during parts of June, August, and September. Please visit our 2014 calendar for current availability. 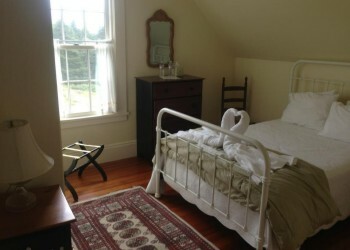 The rental fee is $6900 per week in the high season and $4900 per week in the off season, plus Maine lodging tax. High season is June 22nd through September 21st. Please call (207) 200-7957 or e-mail to inquire about renting the Light Station. A seven-bedroom Lightkeeper's house on 11.1 acres. Three of the bedrooms have one double bed, two have two twins, and two have two doubles. All bedrooms have their own bathroom. 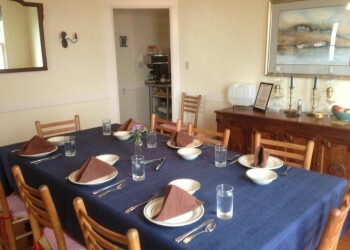 The house also includes two sitting rooms, a library, a dining room, and a full kitchen. All linens are provided. You will be picked up on the mainland by the Whitehead Light Station captain in one of the two Whitehead Light Station boats. The captain will live at the Station to help you enjoy your stay and will be available to take small groups on outings in the boat and on trips to the mainland as you require.